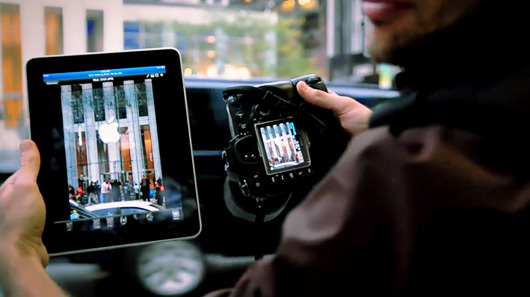 Tether DSLR to iPad | Shelby White - The blog of artist, visual designer and entrepreneur Shelby White. If you’re a photographer and own an iPad this is for you. Tethering your DSLR camera to your iPad is particularly useful in scenarios where you have clients previewing the shots that you take. The iPad alleviates the need for cords and you can simply connect up to a clients iPad and send the images directly. Just like the iPhone, the iPad also memorizes your wifi login so it makes it easy on you and automatically connects to your network. I’d love to see someone actually use this on a shoot. The setup is quite practical and fairly inexpensive (if you already own an iPad). The Eye-Fi Pro X2 card you have to buy is about $130, but once again, well worth it if you’re on the move. Sure, its not free but its an investment. This is awesome! Bummer, I guess I need and iPad now…. Way to slow to use professionally. Now if the iPad could run lightroom or aperture and apply basic presets as it’s showing the photos I’d get a lot more excited. Still cool though. Thanks for sharing Shelby. I agree with ScanMan — this is just a toy. This would be great if it came in CF format, which most pro slr cams are using, such as the nikon that is used in the product shot. bummer. It’s an awesome and promising idea/working concept though.